Dec. 9, 2014, 2:27 p.m.
There’s Google and then there’s Google News. One tries to soak up the entire Internet, the other a curated selection of news sites. It’s easy to confuse the two, since you’ll often get “Google News” results at the top of a standard Google search page even if you never go near the url news.google.com. But they’re distinct parts of Googleland. Google and publishers have a fraught relationship, and plenty have given thought to what it would be like to pull out of one or both Google corpora. (Axel Springer found out.) But how important is each to your overall search traffic? Is it your site’s presence in Google that’s driving it, or its presence in Google News? That’s the question asked in this interesting piece by SEO consultant Adam Sherk. He used a tool to try to determine how much of 80 news sites’ search traffic came from general search and how much came from Google News. The answer: It depends. At the very bottom? 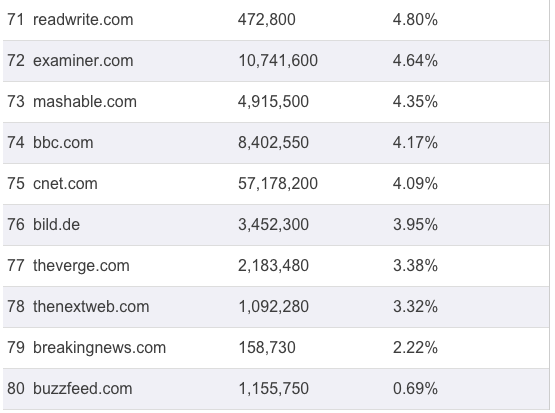 BuzzFeed, with less than 1 percent coming from Google News. It’s hard to generalize too much from the data. The Christian Science Monitor, despite its somewhat old-fashioned reputation, is actually something of a SEO powerhouse, quite good at staying on top of Google Trends and posting webby copy that matches what people are searching for in the moment. It makes sense that Reuters, as a wire service, would do well for in-the-moment news searches. And that BuzzFeed’s search traffic comes overwhelmingly from the non-news side of Google makes sense, given its abundance of evergreen listicles. But you also have sites like Mashable (4%) and Business Insider (5%) in the low-from-Google-News category, and Bloomberg Businessweek (29%) and Newsweek (19%) on the high-from-Google-News end — each of which is the opposite of what I would have expected. So it’s more complicated than it might seem. But the broad majority of sites seem to be in that 5 to 25 percent range — meaning Google News makes up a significant but not overwhelming part of most sites’ search traffic. Check out Sherk’s post to see data on 80 major news sites — both raw totals and the News/non-News split. Benton, Joshua. "How much of your news site’s search traffic comes from Google News? Probably 5 to 25 percent." Nieman Journalism Lab. Nieman Foundation for Journalism at Harvard, 9 Dec. 2014. Web. 23 Apr. 2019. Benton, Joshua. "How much of your news site’s search traffic comes from Google News? Probably 5 to 25 percent." Nieman Journalism Lab. Last modified December 9, 2014. 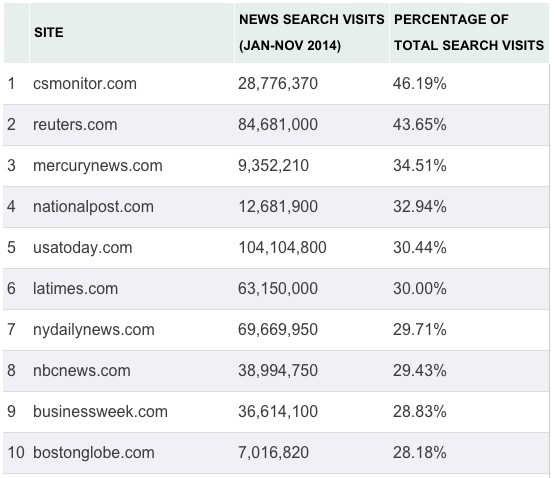 Accessed April 23, 2019. https://www.niemanlab.org/2014/12/how-much-of-your-news-sites-search-traffic-comes-from-google-news-probably-5-to-25-percent/.